In what seemed to be a routine agenda item last night, the LA Unified school board found itself debating a fundamental issue: When you have a few extra bucks do you save for a rainy day or do you pay off your debts right away? The question arose when the board was trying to figure out what to do with the surplus of $45 million from last year. That’s merely pocket change when it comes to a $7.8 billion annual budget, but it brought up some philosophical differences among the board members. Board member Mónica Ratliff, who prides herself on championing fiscal responsibility, asked where the money was going to go and when it was going there. She urged that the money be added to an irrevocable trust for LAUSD retiree health benefits. But, board member Richard Vladovic, who recalled a time school budgets were far more unpredictable, said he would prefer to have the money remain more flexible for a possible catastrophe. He argued to keep the money in reserve for emergencies. Board president Steve Zimmer agreed, citing four fiscal challenges the district is now facing: state funding unpredictability, federal under-funding, debt liabilities and a declining enrollment. “These are the major issues we are facing, and the area that we can make the most impact as a board is the declining enrollment,” he said. “I feel that we need the maximum flexibility to remain solvent,” Vladovic said. 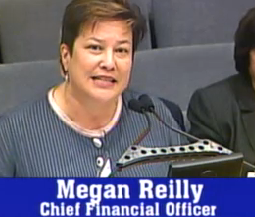 LA Unified’s Chief Financial Officer, Megan Reilly, said the district has about $72.4 million for emergencies. She said that is less than half of one month’s payroll (which is more than $200 million). She asked the board to approve a technical amendment for a report to the Los Angeles County Office of Education. Since the 1960s, the district has offered lifetime health benefits, which helps attract teachers from across the country. The district needs to set aside $500 million a year for 30 years to cover the $5 billion future obligations for retiree benefits, according to a state budget analysis. Last year, the district began setting aside money in an irrevocable trust, and that is where Ratliff wanted the money to go immediately. Zimmer pointed out that the school board did not have to make a specific motion because Superintendent Ramon Cortines and his staff could move the money as they see fit. But, Ratliff shot back, reminding Zimmer how he has said “a lot of times how important it is for the board to weigh in and take a stand.” Zimmer smiled, admitted to saying that a lot and called for a vote. It went 5-2 to put the money into the trust as soon as possible. Vladovic and Zimmer voted against it.